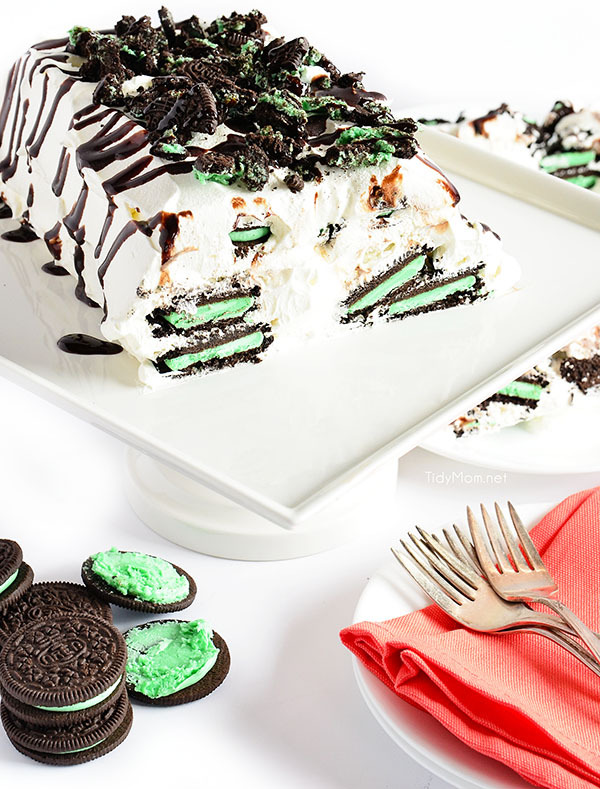 Mint Oreo Icebox Cake This simple version of an icebox cake comes together in no time when you layer mint Oreo’s and Cool Whip. Sometimes when you make a delicious dessert you have to make sacrifices. 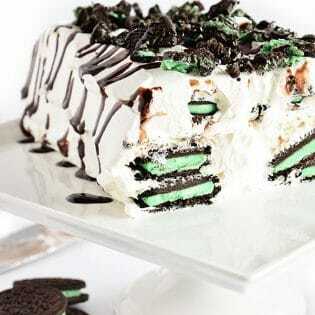 This Mint Oreo Icebox Cake, for example is only two ingredients (3 if you include the chocolate syrup on top) and is is seriously so easy you can make it in five minutes……no baking or cooking involved! So what’s the sacrifice you ask? Other than not fitting in a swimsuit this summer…….. it’s time. This cake needs to be made a day ahead. Last year I made a Raspberry Icebox Cake for my birthday, one of the easiest desserts I’ve ever made…….until I saw Shelly’s Oreo Icebox Cake made with Cool Whip. I’m not sure why it took me a whole year to finally make it! Cakes can be intimidating to make, unless you are Rosie, or Heather. But icebox cake is not only super easy but the best part is, it doesn’t have to look perfect to be beautiful! Embrace the messy cake and make an icebox cake! Start by lining your loaf pan with foil. 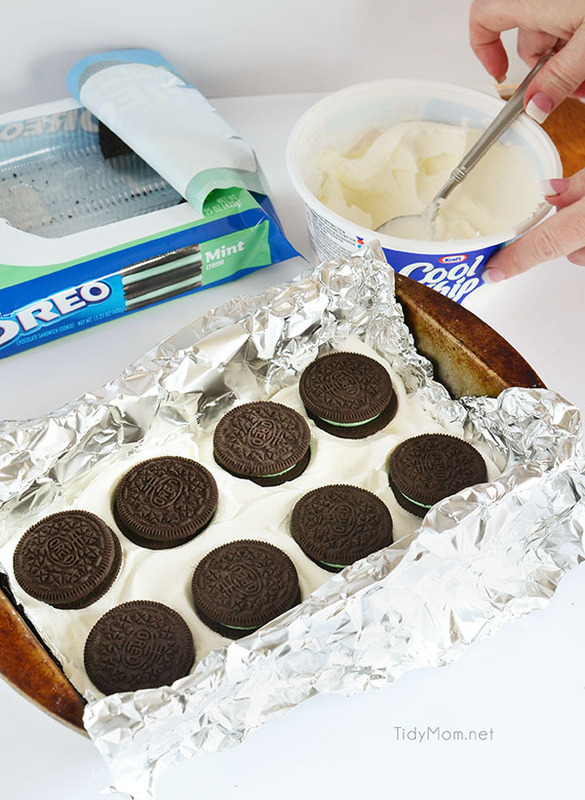 Spread a layer of Cool Whip on the bottom of the pan, then place at least 8 mint Oreo’s on top (you could break up a few more cookies to place in the middle if you want). Cover cookies with more Cool Whip and another layer of cookies. Continue until you have 3-4 layers (I only ended up with 3 layers, but I think you could get 4). Top the last layer of cookies with Cool Whip. Be sure to save a few of tablespoons of Cool Whip for retouching the cake the next day. Cover loosely with a foil tent and refrigerate overnight or longer. When ready to serve, turn cake out on a plate, carefully remove foil and touch up bare spots with reserved Cool Whip, using a small spatula. Garnish the top with chocolate syrup and chopped Oreos. Shelly dunked her Oreo’s in milk before she layer her cake, I might give that a try next time, it will make the cookies even more soft. Next time I plan to break up a few cookies to fill in the gaps with each layer. I totally forgot that I was going to build this cake with pudding and Cool Whip until after I made the cake. So stay tuned for another version I have in mind……what flavor of Oreo’s should I use for the next cake? Regardless of all that, this is one super easy and delicious dessert that the kids could even make! 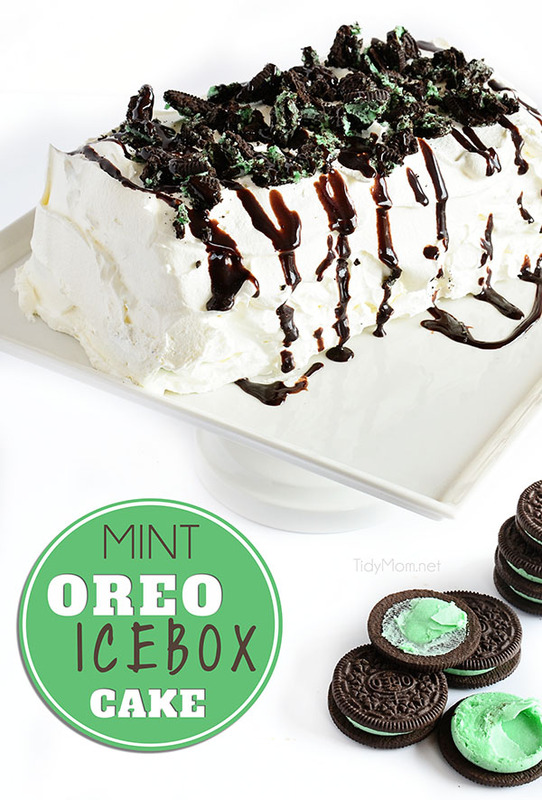 This simple version of an icebox cake comes together in no time when you layer mint Oreo's and Cool Whip. 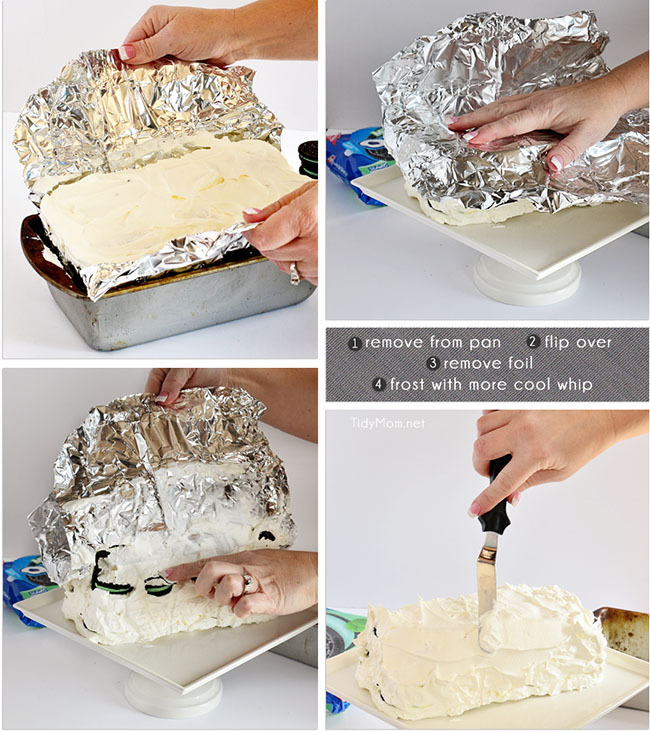 Line an 8 or 9 inch loaf pan with foil. Spread a layer of Cool Whip onto bottom of lined pan and top with 8 cookies (or more if you can). Top with more Cool Whip. Continue until you have 3 layers. Top with Cool Whip. Be sure to reserve a few tablespoons of Cool Whip for retouching cake. Cover loosely with a foil tent and refrigerate overnight or longer. Prior to serving, turn cake out on platter and carefully remove foil. Cover any bare spots on cake with reserved Cool Whip, using small spatula. Garnish the top with chocolate syrup and chopped Oreos. Serve very cold. If you would like more of an ice cream like texture, chill in refrigerator over night to soften cookies, then place in the freezer for two hours before serving. The photo is beautiful!! Just gorgeous! 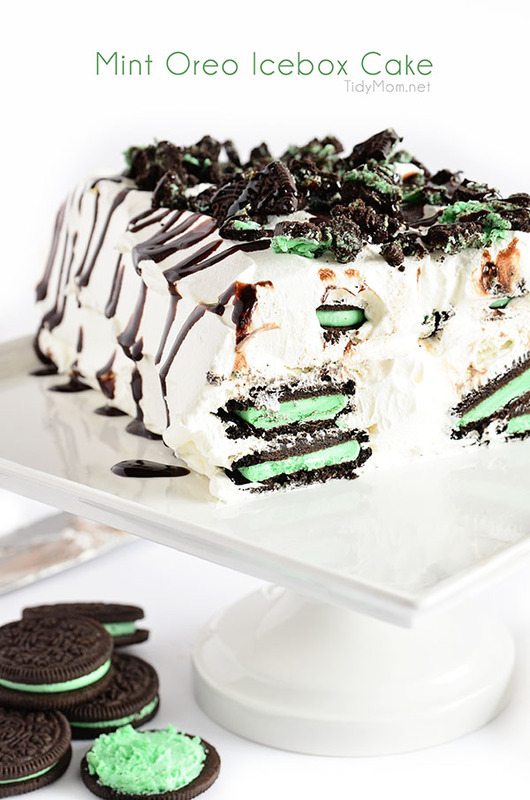 I love the idea of making this mint Oreo ice box cake in a loaf pan! Oh my goodness! I’m a mint chocolate fanatic. This just sent me over the edge. Pinning cause I want to make this. dang, Cheryl! this looks absolutely amazing! you know i’ve never made one of these! i think i need too asap! 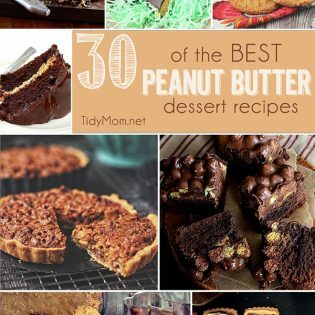 Oh my – this is absolutely gorgeous and I am sure delicious!! Oh wow Cheryl, this looks soooo delicious! I need to have this!! I’m swooning, seriously. I love cool whip way too much, and with mint Oreos????!!!! Pinned! These photos are just stunning!! Love everything about this cake 🙂 Pinning!! I have a feeling my girls would LOVE this!! So pretty, easy and I’m sure yummy! My family would go bonkers over this! Fun!! Oh my gosh….this looks INSANE. My husband and I both love mint, and his birthday is coming up. I guess I know what I’m making to celebrate! Thanks for sharing this recipe. Do they still make the coffee cream oreos? That would make an excellent Tiramisu version. I love mint, too, though. I am definitely going to try this once it gets warmer. Right now, cold desserts only make us feel colder. Ha! This is seriously calling my name!! And who knew it was so easy to throw together?! Oh dear me – that looks like one tasty cake, especially for this “green” time of year! I’ve never tried the chocolate mint Oreos… do they taste like Thin Mints kind of? OH. MY. GOODNESS. Whoa. Need this!!! Does the Icebox cake freeze well? need to travel a hour with it!! Hi Cheryl – this looks DIVINE!!!! I LOOOOOOOVE mint – this is definitely on my “to-make” list! Hope you are doing great!